June marks the beginning of summer, longer days, and warmer weather, but is also one of our favorite months at Survivors of Torture, International – Torture Awareness Month. On June 26, 1987 the Convention Against Torture and Other Cruel, Inhuman and Degrading Treatment or Punishment (CAT) entered into force*. June 26 has been chosen as the International Day in Support of Victims of Torture, and June has been chosen as Torture Awareness Month. 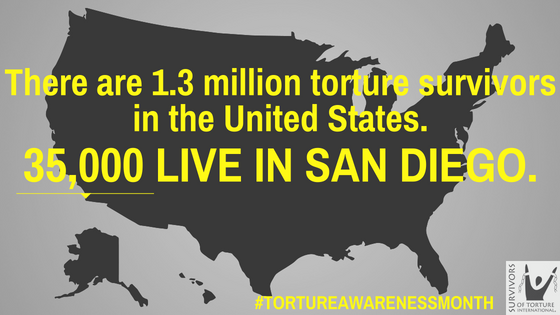 In June, we recognize that torture is one of the most profound human rights abuses, and it affects millions of individuals and their families around the world. This trauma reaches far beyond the direct victims and in some instances, where torture has been used in a systematic and widespread manner, whole societies are affected. Those who survive torture have a guaranteed right to rehabilitation under international law. Providing holistic rehabilitation to survivors of torture and trauma can help heal the effects of torture. SURVIVORS, an accredited IRCT member organization, is proud to offer holistic rehabilitation to as many of San Diego’s estimated 35,000 torture survivors as possible. SURVIVORS’ services address psychological, medical, and social needs for torture survivors, helping them to heal from the trauma they experienced, regain their sense of dignity, and rebuild their lives. *In 1988, President Ronald Regan signed the UN Convention Against Torture, which includes the commitment that, “No exceptional circumstances whatsoever, whether a state of war or a threat of war, international political instability or any other public emergency may be invoked as justification for torture.” The U.S. Senate ratified the Convention in 1994.